Do you need to file for a refugee green card? One year has passed since you came to the United States as a refugee. You now therefore need to file for lawful permanent residence, a refugee green card. This guide to the refugee lawful permanent residence is one of the guides in our green card series. If you need information about a refugee green card, please keep reading this page. If you know that you need help now, please contact us. 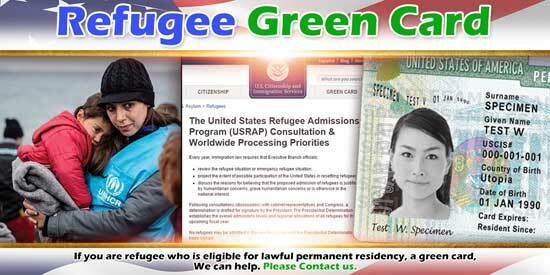 To apply for green Card Process as a refugee you must have received refugee status. The process of applying to become a refugee is beyond the scope of this article, but we cover it in our guide on humanitarian relief. Unlike the asylee greencard, your application for the refugee green card is not discretionary. The United States requires that you apply after one year as a lawful permanent residency. Establishing eligibility to file for green card through refugee status is simple by comparison. You show that you lived in the United States for at least one year after the United States admitted you as a refugee. You may not apply for a refugee green card if the United States terminated your refugee status. Likewise, you may not apply for refugee green card if you have already received lawful permanent resident status in another way. To apply for a green card as a refugee, you submit an application for adjustment of status to United States Citizenship and Immigration Services (USCIS) using form I-485. Your application will consist of the completed form, a couple of passport style photographs, a completed form G-325A and the appropriate medical documents. You do not have to submit a completed I-693 unless the United States found that you are inadmissible for medical reasons at the time you arrived in the United States. In these circumstances, you only need to submit the vaccination part of the medical exam. Completing your Green Card Application Process is evidence of your refugee status, an example of which is a copy of your I-94. If you completed Us Green Card Process and received refugee status as a family unit and you all arrived in the United States at the same time, you can submit your applications together. Each person who needs a refugee green card, must file a separate application. In filing, don’t forget to check the applicant has at least one year in the United States. Immigration Guides provide help to refugees arriving in the United States. If you find that you cannot complete the application process for the refugee green card on your own or with the help of your sponsoring organization, we can help you. Please contact us.